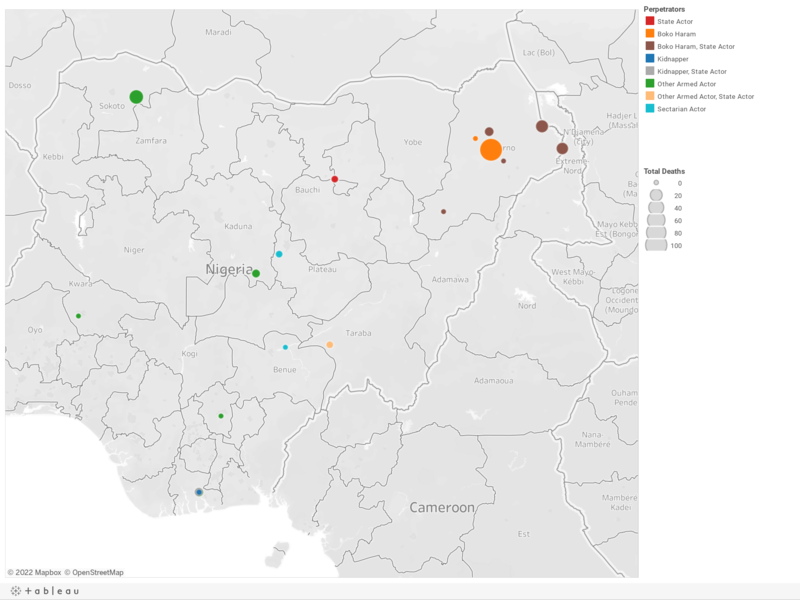 Below is a visualization and description of some of the most significant incidents of political violence in Nigeria from January 12 to 18, 2019. This update also represents violence related to Boko Haram in Cameroon, Chad, and Niger. These incidents will be included in the Nigeria Security Tracker. Since December 26, 2018, Boko Haram has killed one hundred Nigerian soldiers in the Borno area. January 12–14: Cultists killed three in Port Harcourt, Rivers. January 12: Herdsmen killed a fisherman in Ughelli North, Delta. January 13: Gunmen killed twenty-six in Rabah, Sokoto. January 13: Gunmen killed three in Jema'a, Kaduna. January 14: Boko Haram killed twelve in Kala/Balge, Borno. January 15: Boko Haram killed three soldiers in Kala/Balge, Borno. January 15: Nigerian troops killed "some" (estimated at five) Boko Haram militants in Nganzai, Borno. January 17: Gunmen abducted Governor Wike's aide in Port Harcourt, Rivers. January 17: Boko Haram killed three soldiers while the soldiers killed "many" (estimated at fifteen) Boko Haram militants in Ngala, Borno.